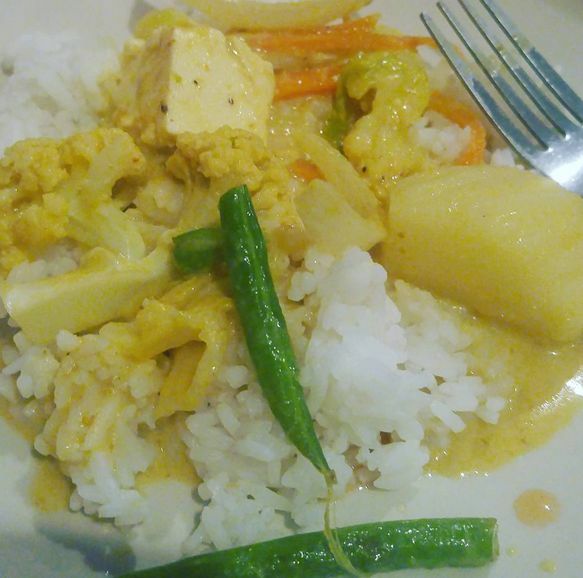 I was looking for a new spot to eat at in Elk Grove over the weekend and Thai Chili Restaurant came up as vegan friendly. Matt was game to check them out. I called ahead and asked about vegan items and they said they had some. So once there we walked up to the place ready for a food adventure. The spot was nice with outdoor and indoor seating - we choose indoor, due to allergies and all. They have a large vegetarian menu so I asked our waitress what could be done vegan, she had another server help us who could point us in the right direction. 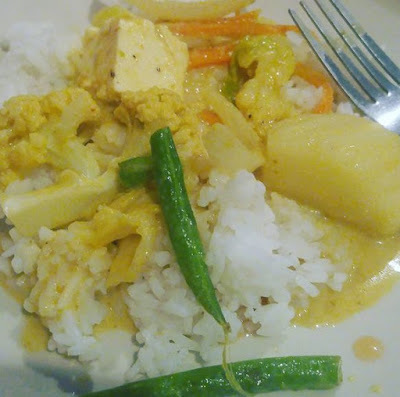 There was a lot of food I wanted to try but he recommended the yellow curry so I ordered avocado yellow curry. We always have to have rice with our curry and they brought out a nice sized portion to go with a big bowl of curry. The curry was lovely. The sauce was thick and rich, super yummy. Big chunks of potatoes, tofu and avocado mixed in with other veggies. I loved how the avocado was warm and soft - very fresh tasting. We would both order this again! Since Matt and I were sharing I said lets go for two appetizers. I really wanted to try the fried bananas - because they sounded really good. Matt pointed out Tofu Lover and being a fan of fried tofu I said we should try that as well. 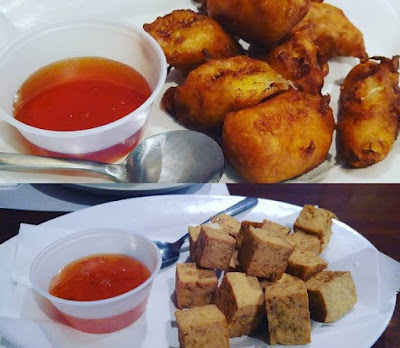 The fried bananas were coated in a light crunchy batter and served with chili sauce. They were sweet and tasty, I wanted to grab a few to go and have them with non-dairy ice cream. I really liked them. The tofu was fried to perfection, crunchy outside and chewy inside and came with a tasty sweet and sour sauce. Even though both items were fried they were not greasy or heavy. The sauces were really good as well, tasting fresh and not from a bottle. I cannot wait to go back. The service was attentive, the space was clean and the food came out fast (even with a crowed). The only complaint is we ate so much and wish we had room for more. Thai Chili Restaurant is located at: 8696 Elk Grove Blvd #5, Elk Grove, C. If you are ever in the area check 'em out!